Thank you to Osteo Bi-Flex® for sponsoring today’s conversation and giveaway. This post contains affiliate links. It’s marathon training season for a lot of us – which means that it’s more important than ever to take care of our joints. Makes sense – but how? How do we keep our joints healthy while participating in high-impact and/or strenuous endurance sports? Your body needs sufficient amounts of essential vitamins and minerals to synthesize and protect cartilage, collagen, and other joint components. Too much fat and sugar can affect your joint comfort, which makes it important to avoid high intake of “bad” fats and simple sugars. But even if you make great dietary choices, you may still need a supplement to help you achieve maximum joint health. Even though the body can synthesize Glucosamine and Chondroitin (both are important for keeping your cartilage healthy), there are few known food sources of these compounds. One way to increase your daily intake is through supplements. Osteo Bi-Flex is a well-known leader and innovator in the field of joint health and wellness. I’ve shared several of their products with you here, and when they contacted me about their new product, Osteo Bi-Flex® EASE, I was happy to share it here with you as well. 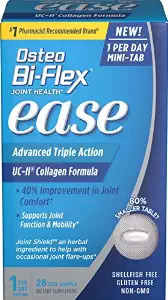 Osteo Bi-Flex® EASE is a daily mini-tab that promotes joint comfort through a breakthrough collagen-based formula. One Osteo Bi-Flex® EASE mini-tab a day supplies Vitamin D3, Joint Shield™, an herbal ingredient that helps with occasional joint flare-ups, and a natural source of collagen called UC-II® that has been shown to improve joint comfort. Osteo Bi-Flex® EASE mini-tabs are 80 percent smaller than standard joint health supplements and are free of gluten and shellfish. And now for the giveaway! Osteo Bi-Flex will provide one lucky winner with 2 boxes of Osteo Bi-Flex® EASE – that’s over $40 worth of supplements. Everything you need to enter is on the Rafflecopter below. Good luck! I wear supportive shoes and replace them regularly. This goes for shoes that I wear during non running times, a well! I never really have done anything to take care of my joints. After long runs, I just lay down for a while to recover or I just hobble along for a while. I’d love to try this! I notice now that at times my joints hurt after a run, or after lifting weights. I just try to stretch more, but I would like to try this product. Thank you for the wonderful giveaway.